As a former Army Battalion Commander, Ive had to navigate through my share of complex logistical environments. Now as the CEO of satellite communications provider Proactive Communications, Inc. (PCI), my military experience is being put to the test with our work in Iraq. Holding the distinction as the first US IT company working directly with the Iraqi Ministry of the Interior (MOI) doesnt come without its challenges! As with any advanced technology deployment, customization has played a critical role in our success installing and operating the worlds largest secure satellite VoIP network, which connects nearly 6,000 Iraqi police, commandos, customs officials, and command centers across the country. The Middle East is definitely a more dangerous place these days and, depending upon your point of view, satellites have played key roles in either creating this dangerous instability, or in preventing a nuclear war from breaking out. Over the last ten years, COTS (Commercial Off-the-Shelf) products have become increasingly popular within the satellite industry. Better, faster, cheaper was the mantra of the mid-90sCOTS products helped to address this mandate. The major European countries are committed to improving their satellite communications capabilities through both dedicated military and dual-use systems. The U.K., France, Spain, Italy and NATO already have dedicated military communications satellites and Germany is planning to launch its own soon. The greater bandwidth required by the post-Cold War focus on digitizing the battlefield and expeditionary warfare have stiffened their resolve to continue to improve communications. Satellite acceleration technologies have been well known to users of military satcom for many years. Performance Enhancing Proxies (PEPs) are now a fixture in todays tactical satcom equipment suites. Todays requirements for secure, interoperable communications systems, as well as rapidly deployable networks for emergency response, are driving the need for inexpensive, simple, satellite earth station antennas, ranging in size from sub-meter to 5 meters in diameter. When selecting and siting antennas, systems engineers rarely consider the earth station antennas vulnerability to damage or destruction by the forces of nature or man. Melbourne, Florida-based Harris Corporation is hosting MILCOM 2007, one of the largest government/industry conferences in the world, at the end of October in Orlando. Co-sponsored by the Armed Forces Communications and Electronics Association (AFCEA) International and the Institute of Electrical and Electronics Engineers (IEEE) Communications Society, MILCOM celebrates its 26th anniversary as the premier international conference for military communications. 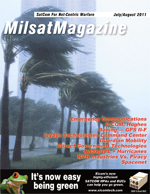 The title of my first offering for MilsatMagazine is actually a preview of a workshop the Global VSAT Forum (GVF) is organizing as part of overall program of content comprising the SMi 9th Annual Global MilSatCom Conference. At the recent ISCe 2007 Conference and Expo, the then-Managing Editor of MilsatMagazine, Virgil Labrador, spoke with Kay Sears, Senior Vice-President, Marketing & Business Development, Intelsat General. The next generation Global Positioning System (GPS) Operational Control Segment (OCX) will provide command, control and mission support for current GPS Block II and all future Block III satellites as well as support for existing and new interfaces. The focus will be on military transformational and civil needs across the globe. This will include advanced anti-jam capabilities, improved system security, accuracy and reliability. GPS OCX will be based on a modern, service-oriented architecture that will integrate government and industry open system standards. During the 50 years since Sputnik gained orbit, many goals have been met; others have succumbed to failure. Yet the indomitable human spirit continues to forge onwards and upwards. Today we have a global satcom industry filled with promise and reward.